Japanese Episode AG 118: "Haruka Derishasu de, Gonbe GET kamo!!" American Episode 389: "Berry, Berry Interesting"
Now that Haruka has all five Contest Ribbons, the young Coordinator begins to prepare for the Grand Festival. She starts off by collecting berries to make Polock with, hoping to improve her pokemon's condition with her special "Haruka Delicious" blend. When she finishes, she feeds the Polock to everyone's pokemon, but they all seem to hate its taste! The only exception is a wild Gonbe who wanders into the Pokemon Center and surprises everyone by eating every last block! Suddenly, the Rocket-Dan, disguised as Polock experts, enter the room and distract everyone while Nyasu and Sonansu steal all the other trainers' Polock. When the other trainers notice the theft, they blame Gonbe, blaming the gluttonous pokemon for eating all their Polock when they weren't looking. Haruka stands up for the pokemon and eventually decides to capture Gonbe to solve everyone's problem. She sends out her Wakashamo to battle, but Gonbe seems more interested in eating and sleeping than battling. 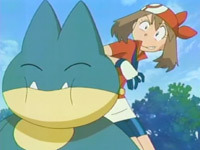 The Rocket-Dan soon appear and try to get away with all the trainers' Polocks, but Haruka's Wakashamo and Satoshi's Yukiwarashi work together to send them blasting off. Now that the mystery of the missing Polock is solved, Haruka throws her Monster Ball and catches herself a Gonbe! With a new partner in her arsenal, Haruka is now more determined than ever to work hard to win in the Grand Festival! And so the whoring out of Gonbe begins. Y'know, Gonbe isn't all that bad. The little guy can actually be quite cute, and its antics can be amusing on occasion. But the anime producers will shove it down our throats for the next dozen episodes or so, and before long you really start to get sick of the little guy. I know they're trying to pimp out the upcoming games (Diamond and Pearl), but the way they showcase Gonbe is going to start to get a little overboard. You all will see what I mean soon enough. The dubbed version of this episode is pretty good. You could tell that Veronica Taylor and Eric Stuart had a lot of fun after their characters ate that Tamato Berry (even if their voices weren't as muffled as they were in the Japanese version), and it's nice to hear Munchlax keep the voice it had in "Destiny Deoxys." It's also extremely nice to hear that 4Kids correctly translate Takeshi's line about Naoko (the girl who gave him the recipe book waaaay back in AG 012). It's kind of funny that they remember that Naoko was named Natalie in that episode but couldn't be bothered to keep Jackson's name in "The Legend of Thunder," but then again, that was obviously done by a different team than the ones that worked on this episode. The opening shot of the island is shortened by three seconds. So you know how we see Brock's fantasies where he's sitting at a bar with a wine glass full of milk, trying to woo Nurse Joy? And how there's a bottle on the bar labeled "MILK" and everything? Well, would you believe that 4Kids didn't alter this scene at all? That it was originally animated with the milk bottle and everything? As odd as it sounds, that's exactly the case here. 4Kids didn't put a drop of digital paint on any of the scenes, and they didn't cut anything out either. What you see on Kids' WB! is what Japanese fans saw on TV-Tokyo. The only thing I can guess is that 4Kids made a phone call to the Japanese producers and asked them to cool it with all the scenes featuring alcohol. If that's what happened, then the show is being pre-censored for 4Kids' convenience. So who wants to bet that, within a year, we won't be seeing any onigiri in the Japanese version as well?. A second is cut from the shot of Gonbe walking right after the Trainer's Choice commercial break. And finally, two seconds are trimmed from the episode's TO BE CONTINUED... screen.